Once again, as we have for the previous 47 consecutive years, the cumulative, collective and continuous wants of Humanity have exceeded the capacity and capability of the our planet to meet thosedemands. (1)And this year we did it in record time. Humanity is acting as if we have access to the biological capacity of 1.7 Earths. (2) Clearly we do not. When we assume that we can use 20.4 months of resources in a 12-month year, we are acting to our detriment. The only way we can overcome the shortfall that we have created is by increasing pollution and/or reducing the capability of the planet’s biocapacity to meet future demands. After all, the overshoot is created by our overharvesting of the sea, the land, and the forests as well as compromising the quality of the air and water upon which life depends. Overshoot has become our de facto modis operandi. It cannot continue to be our legacy if we wish to have a legacy. Cultures, civilizations collapse and species disappear when they do not, or cannot, change their lifeways to stay in ecological balance with biocapacity of their homeland. Overshoot is a bad habit that we must break. And I know that nothing is harder than breaking a bad habit that we enjoy. Consuming resources while assuming that we have no responsibility relative to the negative impacts of those actions is the great illusion (delusion) of our day. 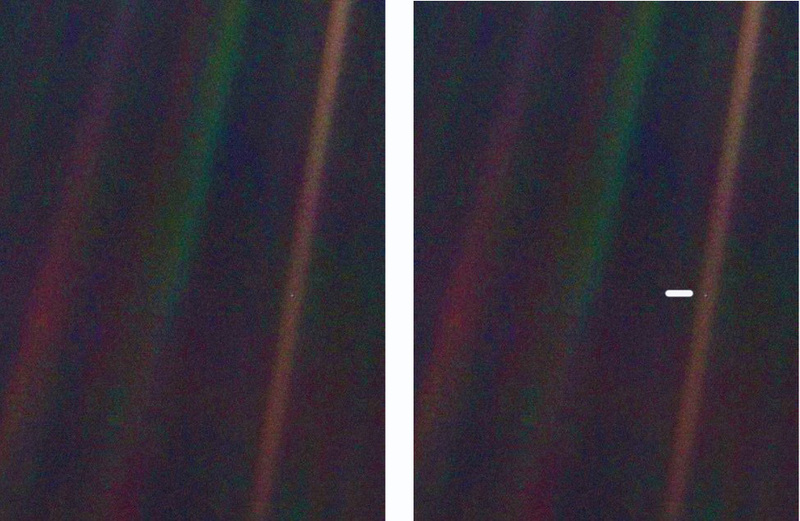 Do we really, truly believe that we are that disconnected from the planet on which we live? Do we really, truly believe that we are not creative enough to find more effective and efficient ways to live so that we reduce pollution and waste? We have spent 48 years putting ourselves at increasing risk. There is a #move the date (6)campaign because that is what we have to do. We are on the wrong road, and we have to move the date back. Like most habits one tries to break, this one will be slow at the start, there will be slips and slides, but as the concept and desire for change takes hold, the process will pick up speed and be successful. The days of the ‘economy verses environment’ fight are over, and really have been for several years. How do I know this, – the World Economic Forum in Davos, Switzerland tells me so. 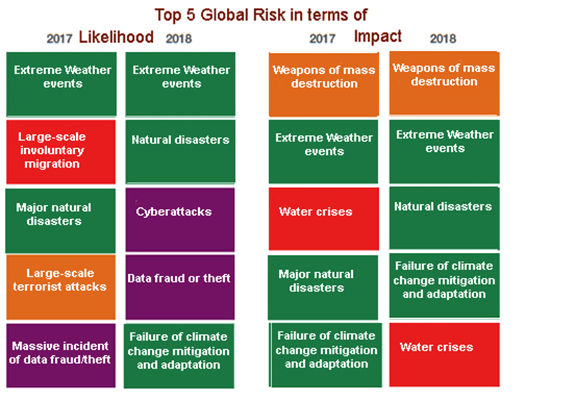 Since 2011 environmental factors have been in the top 5 global risks both in likelihood and in impact. This year, environmental factors dominate both categories. While those statements may seem obvious, our planetary footprint of 1.7 earths(2), the increase of greenhouse gases in the atmosphere, extreme weather events, ocean acidification, air pollution, water pollution, and the extinction of 150 species per day(3) clearly indicates that collectively we are not behaving in a way that understands and acknowledges the realities of the only know planet in the universe on which we can exist. There is hope and optimism for the future, provided we start thinking and acting in a planetary context. Given the lag time between cause and effect at a global scale, in the next 20-30 years we are going to experience pain from the events we unknowingly and unwittingly initiated decades past. As to the actions we collectively take going forth, it will be our children and grandchildren who will really reap the benefits. But that’s OK. Really, isn’t that what we are supposed to do – set up the next generation so it can have a better quality of life than previous generations? Can do and will do are very different things. Will those who are ‘comfortably unaware’ be willing to acknowledge their differentiated responsibility to the health and viability of our planet’s future? I do not know. Of what I am sure is that humanity’s future will be a shared one. Imagine a community integrated into a nature preserve with 50 miles of hiking and biking trails. From home you can easily walk to town, to a trailhead or to a series of lakes. The town is complete with schools and health care facilities as well as community gardens, a five acre farm and a seasonally/locally sourced farm to table restaurant. And it is all solar powered… and all homes include one Gbps Wi-Fi. To get to Babcock Ranch, Florida take exit 143 off of I-75. Go east on State Road 78. At the junction of SR 78 with State Road 31, go North SR 31 to Crescent Loop. At Crescent Loop go East to the Town Center of Babcock Ranch. From I-75 to Crescent Loop is approximately 8.8 miles. To me, the significance of the winter solstice is not that it is the longest night and the shortest day; it is the promise of the sun before the depth of winter. It is the sign that hope and joy overcome dark and cold- be it of the seasons or of our souls. The winter solstice is about renewal, beginnings and the coming warmth of spring. It is a time of celebration; for each day is longer, brighter, stronger. Perhaps that is why the winter solstice tends to bring to mind “A Christmas Carol” by Charles Dickens. Like many people I enjoy witnessing Scrooge’s transformation from ‘business’ Scrooge to ‘humanitarian’ Scrooge with the aid of the three spirits. At the start of the story, Scrooge, like many of us, is a victim of siloed thinking. This is what I am, and this is what I do. And my worldview and assessment of others is based on the measures I use to quantify and qualify success in the context of my silo. faltered Scrooge, who now began to apply this to himself. But it’s Marley’s Ghost who is the hero and guiding light of the story. His words are the ones to which we should pay attention- for he is the bringing the change of consciousness. He may even be the first businessman to promote the Triple Bottom Line, who also understood the hierarchical value of the Planet>People >Profit, and explained the scope and balance of concerns needed to achieve sustainability. The story of Scrooge shows that we can change our behaviors and our priorities when we have a change of consciousness. He may have needed the assistance and reminders of three consultants (Christmas Past, Christmas Present and Christmas Future), but ultimately it is Scrooge who, in heart, mind and body, comprehends the need for change. And so it is with Scrooge. He departs from his previous course and thrives by living his altered life. And so it is with humanity today. The extreme environmental events we are living with and through; the growing disparity of incomes; the social angst, malaise, anger, hunger, and frustration are the foreshadowing of the growing grimness of our coming future if we stay our current course. Will we embrace the words of Marley as Scrooge did, and change? Or will we stay in our silos and pretend that our trade is more important than everything else now and forever? 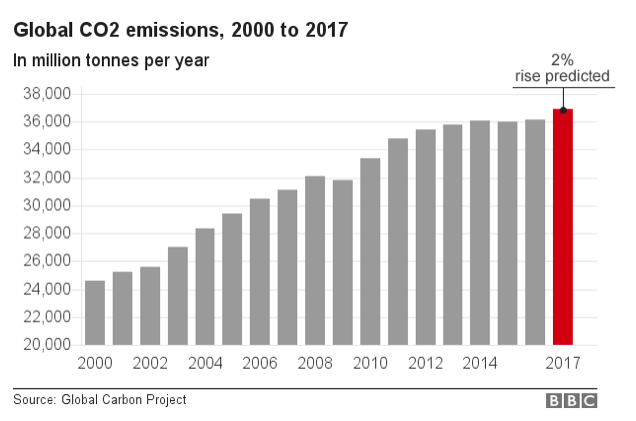 In 2017, the world is witnessing the first increase in CO2 emissions in 3 years*4. The estimated rise is 2%, most of that coming from an increase in the use of Coal. 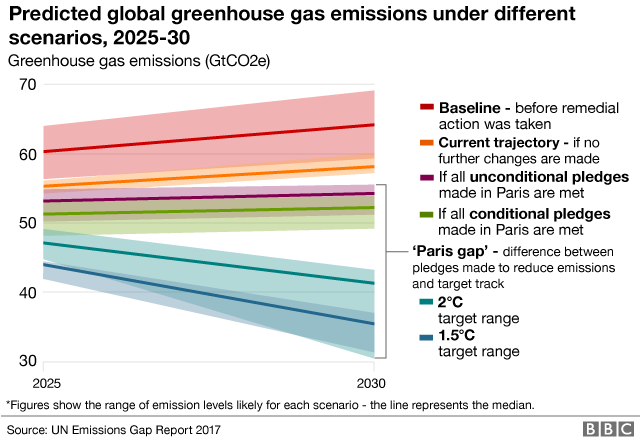 One was that each country set its own voluntary, non-legally binding target projections to reduce emissions. The second was the 5-year time lag between agreeing to the PAC and the official start of the agreement. The third, and most problematic weakness, was that the cumulative promise made by all parties was too meager to achieve the stated goal; thus creating the Paris Gap*5between preference and reality. 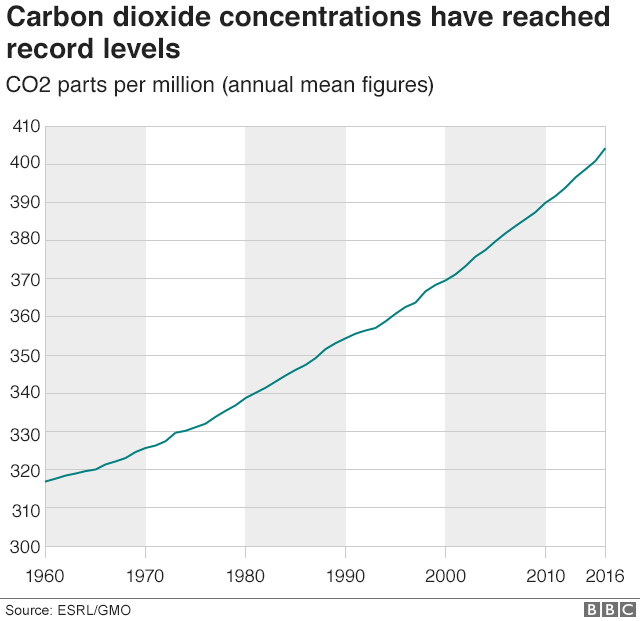 The increase in atmospheric CO2 in 2016 was not about an increase in emissions, but the decrease in the capacity of the ocean and plant life to uptake (absorb or use) the CO2 due to droughts, wildfires, and high temperatures*7. 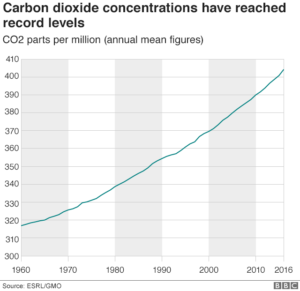 Humanity’s previous emission of greenhouse gases (GHGs) contributes to the cause, severity, and changing frequency of these events making more and more of these events Human’s Nature. Actions speak louder than words. Knowledge is neither a viable nor functional substitution for doing. On Monday night I was at a talk by Alize´ Carrère. While the presentation was entitled “Sustainability in a Changing World,” its real focus was on how individuals/communities/cultures are adapting to the climate change that they are currently facing. Her key examples were the Lavakas of Madagascar, floating gardens and floating farms in Bangladesh, The Shupta Project, and the last was about a community spear fishing Crown of Thorn Starfish and turning them into organic compost. The Lavaka are the “holes” made in the landscape when the ground collapses after deforestation and the tree roots are no longer available to help stabilize the soil structure. The question then becomes what should one do – restore the prior landscape or adapt to the new landscape? Restore would focus on replanting the missing forest to regain habitat while creating a carbon sink. However, many of the local individuals have opted to adapt to the new landscape. The vegetation in the Lavakas is less prone to fire, and the drainage in the Lavakas makes them an ideal place to grow crops. As to the floating gardens and farms in Bangladesh, the issue there is that the combination of Sea Level Rise, more powerful monsoons, and river flooding due to glacier melt means that in some parts of the country ‘wet’ has become the predominate condition. As such housing, schooling and agriculture have needed to adapt to a water world. So boats have become the architecture of education, while rafts and constructed floating islands have become the ‘fields’ of farming. Frequently the buoyant farms have nets suspended underneath them for fish farming and/or a mesh enclosure around them that serves as a duck pen. Adaptive innovation provided a way to maintain community independence thus avoiding the uncertainty of becoming a climate refugee. The Shupa Project has allowed people to continue farming and living in the region even though the presence of glacial melt water has become unpredictable. The adaptation in this project was to siphon water from the glacier fed streams and use the difference in pressure between high elevation source of the water and the lower elevation farming areas to create a water fountain. During the winter, the water droplets are caught on strands of thread or metal and freeze. Some of the ice shupas created are as much as 90 feet tall! Then the melt water from the ice shupas is used as the irrigation source for agriculture. Regarding the Crown of Thorn Starfish (COTs), this issue was generated by over harvesting the trumpet shell conch because of their value in the tourist and shell trades. Once the predator was gone, the COTs population increased and resulted in the overgrazing and killing of the coral reefs. The adaptation was to spear the COTs and transport them to land. (The COTs are speared due to the toxicity of the starfish). Once the COTs have dried, they are crushed and used as fertilizer. Alize´ spoke of the three options a community has relative to environmental changes it is experiencing: mitigate, adapt, or suffer. The degree to which the previous examples are coping mechanism or solutions will be determined by the success of mitigation at the planetary scale relative to the adaptive capacity of the community. She then expanded the conversation to how do you teach high-stakes problem in a low-stakes environment? The concern is that those with a “comfortable reality” are potentially the least adaptable. Adaptation is a mindset. But if you believe that you or your community has sufficient financial capability and an adequate period of time to avoid or minimize the impact of a changing environment, then you may not respond to the coming risks and liabilities soon enough or fast enough. Rather than adapting, the functional outcome of your strategy may be to make yourself a climate refugee. Currently, it is the people on the edge who are adapting. She closed the presentation with the request that we make an effort to change the narrative of climate change and its associated attributes from doom and loss to one of resilience. With apologies to Vivian Greene, our climate focus should not be on the size of the harm, but our ability to adapt to the change if we want our communities to have a viable and, hopefully, verdant future. Images of the aforementioned and similar projects can be found on line. President’s Climate Council has been disbanded. The disbanding of the Climate Council1 was an easy story to miss in the last couple of weeks of statutes, protests, Harvey and floods. Even today’s news of the US State Department’s proposed reorganization2, which functionally demotes the discussions on Climate Change as well as the Arctic Region, was barely mentioned as the media brought us images of the rescues of the now internally displaced persons from Houston and surrounding regions. How we view Hurricane Harvey3 and how we view the news that for the first time a LNG tanker crossed the northern sea route from Europe to Asia without the assistance of an icebreaker4 is a reflection of how we think. Given the geographical separation, it would be easy to see these as isolated events. Given their historic context and nature (unprecedented flooding versus a successful voyage through the northwest passage) it would be reasonable to disconnect the two events. Yet there is a way to connect both events. Climate change, in the context of global warming, has been central to the reduction of both the surface area and the thickness of polar ice5, thus making a northwest passage possible. That same warming of the oceans is what has brought the Gulf of Mexico to record high temperatures6 facilitating the strength of hurricanes. High air temperature also allows for greater water content in the atmosphere, which can trigger larger rain events. Add to this a heat wave in the west and a high-pressure area to the east and the hurricane gets trapped7,8 where it is. Is Hurricane Harvey a once in a lifetime event? I doubt it. It may be a once-in-a-lifetime experience for Houston, but not for the Gulf or the U.S.
What does any of this have to do with disbanding the Climate Council? You cannot use information you do not have. And you cannot evaluate the relative importance of the answer to a question that was not asked. We are in a time of increasingly rapid climate change. The past is losing its validity as a model for predicting the future. As the projections on rainfall for the Houston region were being made, many people found the numbers hard to believe. They did not comply with past personal experience or recorded memory. But the truth of the projections continues to play out. I can appreciate the wish that climate change will not happen. But I also accept the reality that it is. Welcomed or not, we need climate councils. We need people in the room when decisions are being made who are willing to ask the uncomfortable questions, and are knowledgeable about the dynamic projections of our coming climate and its implications. We need people who can help us prepare for the next Harvey while also offering insights on how to reduce the number, frequency, and scale of the future sons and daughters of Harvey. 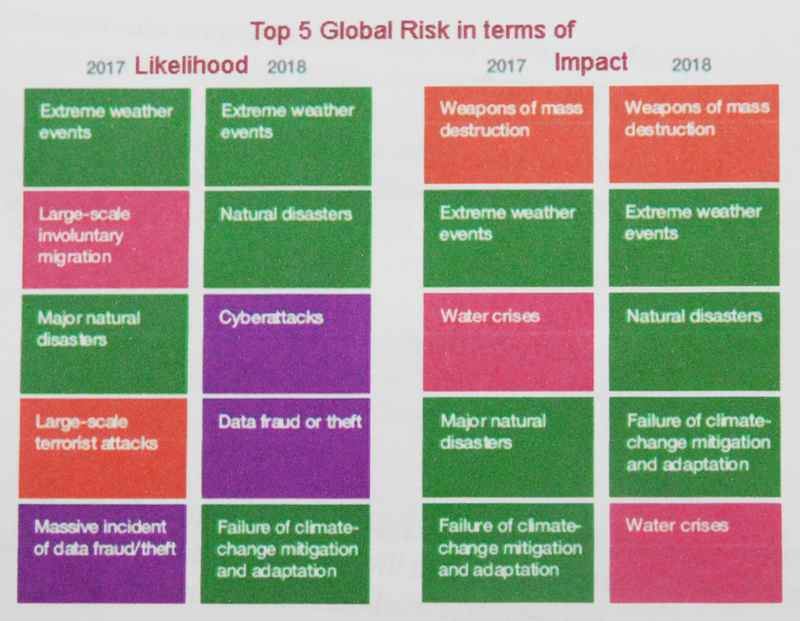 At its core a climate council is really about vulnerability assessment and risk management. They are trying to save lives and minimize future property, infrastructure, and economic loss. Disbanding the climate council does not make climate change in all its various forms go away. It just makes us more unprepared. And that is a risk we should not accept. Earth Overshoot Day is Here Again! Happy August 2nd, 2017, the earliest Earth Overshoot Day Ever. This year, humanity has been able to exceed the bio-capacity of the Earth 6 days earlier than it did last year and 11 days earlier than 2015. I am well aware that many of us get anxious about big events. Sometimes we want them to come sooner because we want to enjoy them. Sometimes we want them to come simply so we can get past them. Earth Overshoot Day should never fall into either category! In fact, Earth Overshoot Day1 is one of those days that should never happen. We all actively, if unknowingly, participate in creating Earth Overshoot Day. We generate Earth Overshoot Day through our collective, cumulative and continuous generation of waste and pollution, as well as our financial support of disposable objects, “non-repairable” technology, excessive packaging, extensive shipping and over harvesting of resources. Coupling those activities with our unawareness or insensitivity to the implications and scale of how things are made, grown, manufactured, used and disposed creates a formula for accelerating the arrival of Earth Overshoot Day. 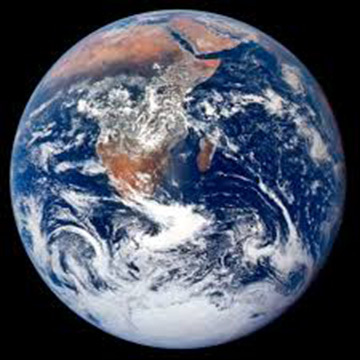 The long-term concern regarding Earth Overshoot Day is that every year we overshoot the bio-capacity of the planet is a year in which we reduce the ability, robustness, resilience, and bio-capacity of the Earth to support our species. The earlier Earth Overshoot Day arrives, the more risk we put on our long-term survival. If we use the common estimates for population growth and species loss, we will add 80 million people2 while loosing 54,750 species3 in the next 365 days. That is a rapid annual increase in need/demand while suffering a major loss in biological resources. Unless we actively engage in reconceptualizing and redesigning how humanity could/can positively interact with and support/enhance the regenerative bio-capacity of the planet, Earth Overshoot Day will continue to come earlier and earlier – putting us at ever increasing risk. Earth Overshoot Day is not really a measure of planetary health and happiness. 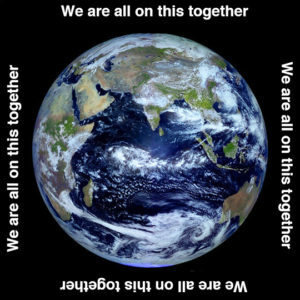 Instead it is a measure of how well we are getting along with the planet. It is a measure of whether or not we are acting in a way that supports the continuation of our civilization. 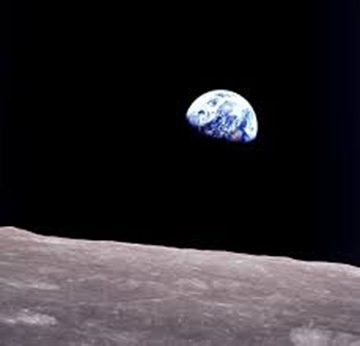 If there are no Earth Overshoot Days, then we are supporting the mechanism and systems that promote our continuation. If there are Earth Overshoot Days, then we are not. This year’s record early Earth Overshoot Day indicates that we are not saving ourselves from ourselves. And that has to stop. 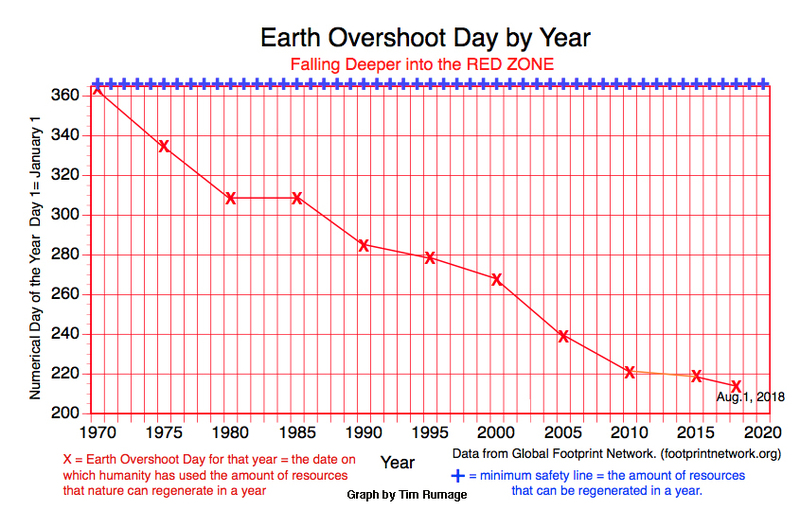 We need to roll back the calendar on Earth Overshoot Day. Right now we are using 20 months of Earth bio-capacity per year. At a minimum we need to match demand with capability and thrive on 12 months of bio-capacity per year. If we want to repair the harm done by this and previous Earth Overshoot Days, then we will need to prosper on 11 months of bio-capacity per year until we make the system whole again. These changes are not as daunting as they seem. Currently 60% of our ecological footprint goes to absorbing Carbon pollution1. Getting rid of pollution and utilizing waste as a resource does most of the restoration for us. When we not only remember that all things are connected, but act in a way that supports the connections, we can say good-by to Earth Overshoot Day. And that would be a day worth celebrating.